Have you ever thought why you are not able to generate any sales from your affiliate campaigns, whereas the other marketer (blogger) is generating thousands of dollars by promoting same products? How your competitor blogger is able to earn much more with same amount of traffic? Well, these are the common questions that arise in the mind of every blogger who wants to monetize his blog. The most important thing (quality) one needs to be successful online and sadly which most of the bloggers don’t have is credibility. You must have to establish yourself as a credible source in your niche to be successful, either online or in the real world. And, in the current scenario, when thousands of blogs are being created every day and internet is filled with scams and poor quality products, having credibility in the online world becomes lot more important than ever before. No buyer (including you) will buy a product on the recommendation of the blogger whom he had never heard of. It doesn’t matter whether you are promoting a high quality product or not, if your target audience doesn’t know about you, if you are not seen as an expert in your niche, people are not going to trust you and buy from you. Simply put – before trying to sell something, you must have to put efforts in building some credibility for you and to establish yourself as an expert in your niche. Though, building credibility is not rocket science, it is also not an overnight process. Building a decent amount of credibility and reputation can easily takes months and years. But still to help you in your mission of building credibility we’ve compiled a list of five effective tips you can follow to increase your credibility. Practice Transparency – The first step to build credibility online is to practice transparency. Your readers must know if you are earning anything from the products they are going to buy on your advice or if the content they are reading is your honest opinion or a compensated post. Don’t try to hide anything from your readers as it can harm your credibility in long term. 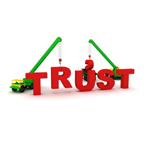 The more you disclose, the more your readers will trust you. Network with Other Credible Sources – Birds of a feather flock together i.e. the person with similar taste move together. The same rule applies to online marketing and blogging world. Develop relationship with already successful people of your niche. Not only these relations will make you look like an expert in front of your target audience, but will also help you a lot in achieving your goals. Remember, the more you will connect with other credible people of your niche, the quicker you will build your credibility. Don’t Be a Fake – You won’t be able to build any credibility amongst your target audience if you pretend to be someone else. Blog only about what you know and try to establish yourself in the niche you really have knowledge of. Blogging demands a lot of hard work and patience so it will be very hard for you if you blog about something you are not familiar with or you are not good at. Tell About Your Achievements – Do you have a recognizable degree related to your niche? Have you written any book on the subject? Do you have any awards or achievements under your belt? Have you ever been mentioned in a newspaper or any other reputed website? If answer to any of the above question is ‘Yes,’ then list those achievements on your blog, so that your readers can see these proofs and start trusting you. Show Them You Are a Real Person – The last thing a buyer would like to do is to buy from a person (alien) whom they can’t contact easily. One of the first things a reader do on visiting a new blog is to check the “about” page of that blogger. Make sure that you’ve a well written “about” page with all the necessary information a reader may need and your contact details. You can also include a bio photo. There is no short and easy way to build credibility. Establishing yourself as a credible blogger in any niche requires lot of patience, hard work and of course Blogging. So, Keep Blogging! People fail to see that quality on the web is very important these days. In my experience in blogging I will say amen to this article because it really needs hard work and long patience plus perseverance to have honest and true success in this business! That is the main reason why I did not stand the tides, i quit and I find something else that will suite my taste! You are very correct with this article because there are so many scam in the net and it is harder to buy a consumer-welfare products now than 5 years ago. Speaking your mind whether in or out the internet, you have to take into consideration your credibility. It is important to a person to be honest and truthful even if your identity might have been hidden.